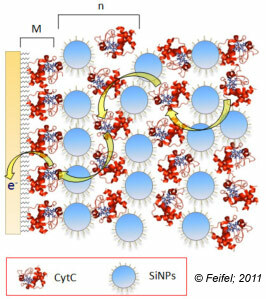 The immobilization of various proteins on electrodes has become a favorite tool in bioanalysis. There are several examples where high activities and direct electron transfer can be achieved. For the establishment of artificial signal chains-converting the presence of a certain analyte molecule in a current response of an electrode-protein functionalities have to be coupled to electrochemical detection schemes. For this purpose an electronic communication between the protein an the electrode has to be established. Signal generation is based on a stepwise electron transfer towards or from the electrode. This can be realized in different ways: a) reaction products or co-substrates can be converted at the electrode, b) a redox-active shuttle molecule can be used between the biocatalyst and the electrode (so called mediators) or c) a direct electron transfer from a redox centre of the protein to the electrode can be achieved. Protein electrodes are not limited to an arrangement of monolayers on the electrode surface but also different multilayer systems can be established. Also here, communication with the electrode can be ensure by reaction production or shuttle molecules (free diffusable or bound) but also by interprotein electron transfer. Advantageously, multiprotein architectures can be used as key part in biosensors, biofuel cells or biohybrid systems imitating essential biological functions. The combination of protein architectures with nanoparticles on electrodes is a current research trend. Feifel, S.C., Kapp, A. and Lisdat, F. (2014) Protein multilayer architectures on electrodes for anlayte detection. Adv Biochem Eng Biotechnol, 140:253-98.